When I recently heard about the plan to bring a half million people together for a peace meditation, I dropped everything and traveled to Sri Lanka to participate. I didn’t go only to show solidarity with my beloved Sarvodaya movement but also for my own benefit. Because of the ongoing violence in the world, including my country’s ‘war on terrorism,’ I longed to see a saner dimension of the human spirit.I needed a hit of peace just like I need oxygen. I was first introduced to Dr. A. T. Ariyaratne and the Sarvodaya movement during a visit to Sri Lanka twenty-six years ago. Ariyaratne, or Ani, as he is called by his friends overseas, had worked in India with Vinoba Bhave and other Gandhians, and in 1958 started a movement in Sri Lanka that he named Sarvodaya. Gandhi had used the term to mean the uplift of all, but Ani added a distinct Buddhist flavor to the name, using sarvodoya to denote both the awakening of all and the awakening of the whole person (sarva-udaya). As I saw how this movement was applying the Buddha’s teachings to social and economic situations, I was deeply inspired.In 1979 and 1980, 1 spent a year with Sarvodaya as a participant observer, which included going through trainings for village workers. Eventually I wrote a book about the movement, entitled Dharma and Development. Over the years, my connection with Sarvodaya has been a river of blessings in my life. The many lessons it has taught me about dharma and service include: trust the intelligence of people, enlist the young, and give everyone a chance to experience their innate generosity or dana.Shortly after my year with Sarvodaya, the Sri Lankan civil war erupted on a major scale. The Hindu Tamils in the north and the Buddhist Sinhalese in the central and southern regions had inherited divisions and animosities fostered by the British colonial administration. Extremists on both sides took hold’the right-wing Buddhists in the councils of government and the separatist Tamil Tigers in their rebel strongholds. The spiraling violence of military offenses and suicide bombings cost 65,000 lives, traumatized a whole generation, and wrecked the Sri Lankan economy. Sarvodaya, which had worked with both sides in the civil war, ran refugee camps and restoration and rehabilitation projects. A couple of years ago, when hopes for peace were at a nadir, Ani decided to emphasize what he called ‘changing the psycho-sphere’: he started organizing peace meditations. 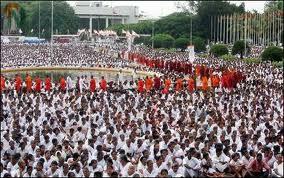 When my husband and I visited Sri Lanka in the winter of 2001, the first of these had just been held in Colombo, drawing 170000 people to meditate for peace. Others were held around the country as well. By last December, the psycho-sphere had changed enough to allow Ranil Wickremesingle to be elected prime minister, with a mandate to negotiate peace. By February, a cease-fire hetween the government and the Tamil Tigers was brokered by Norway. Immediately thereafter, in order to give the cease-fire a solid chance, Sarvodaya announced a mega peace meditation, Maha Shanti Samadhi Day. It called for a gathering of half a million people at Anuradhapura, the sacred royal city in the north central part of the island, near the areas of the worst fighting.I arrived at Anuradhapuna on the day of the meditation. The sacred site, probably half a mile in diameter, contains several great stupas and the world’s most ancient bodhi tree, which is said to have grown from a cutting taken from the tree that sheltered the Buddha during his enlightenment and brought to Sri Lanka by the great Indian king Asoka’s daughter, Sakyaditta. When I got there, people were streaming in from all directions. In the tradition of these events, everyone was dressed in white and moving in silence. They had arrived from all over the country on foot and via trains, bicycles and, according to one person’s count, four thousand buses.Young Sarvodayena had put up scores of loud-speakers in the trees, and I wondered whether they were going to play Buddhist or Hindu music. What I heard coming oven the speakers was Kitaro’s Silk Road; it created an ambiance of sacred adventuring across vast expanses for the well-being of all.The meditation ceremony took place at 3:00 P.M. Members of the clergy of all the religions of Sri Lanka were gathered on a platform, and each said a few words. In front of them on a slightly lower stage, surrounded by flowers, was Ani. After the spoken prayers, he began to lead us all in anapanasati, mindfulness of breathing in and breathing out.The silence was the most exquisite sound I’ve even heard. It was the sound of half a million people (actually the number turned out to be 650,000) being quiet together in the biggest meditation ever held on planet Earth. I said to myself ‘This is the sound of bombs not exploding, of land mines not going off, of machine guns not firing. This is possible.’ It was what I’d gone to Sri Lanka to hear. 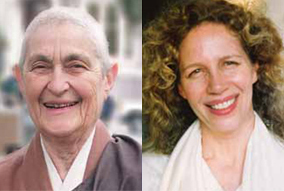 After a period of anapanasati, Ani led a metta meditation guiding us into lovingkindness. It was followed by a practice that l always associate with Ani, not having learned from anyone else. This was adhistana or settling into firm resolve. Ani does the practice every morning making the firm resolve to establish peace.What moved me most of all was a ceremony held just before the massive meditation itself. In the sacred compound around the bodhi tree, a smaller group of fifty to one hundred gathered to inaugurate the village-to-village ‘link-up program’ Sarvodaya is organizing. A thousand villages selected from the Tamil area are paired, one to one, with a thousand villages in the Sinhalese area; people from the latter, less devastated villages will go to the villages in the more devastated areas and help them rebuild. I heard about one village that had received advance notice of the program and overnight had loaded two lorries with roofing materials and were ready to go.There is an ancient bell in the bodhi tree conmpound, and at one o’clock the presiding monk rang it to inaugurate the link-up program; at that precise moment bells rang over Sri Lanka. Then two groups of young people dressed in white came forward. They had been chosen from two of the villages that were linked up, one Tamil and one Sinhalese, and each group carried a tray of specially prepared food. With the food they brought, they fed each other; then the food was passed around and we all took some. I cry every time I remember this moment. I still imagine that I can taste that sweet coconut and rice, because I knew for certain as I ate it that what we want most is not to blow each other up but to feed each otherI want you to know that the peace meditations and the link-up program are both part of a larger Sarvodaya vision called the Five Hundred Year Peace Plan. When I heard about the plan and how serious the Sarvodayans are about it, I could actually feel a sense of release in my chest. I suddenly realized, ‘Oh, of course. We don’t have to do it all in one year, or even one lifetime.’ This five hundred year peace plan acknowledges the long, hard path to true peace and sets forth concrete steps along that path.Among the first steps is to publicize they plan and then conduct a variety of peace activities throughout the country, including amity camps, community dialogues and interreligious gatherings. These will set the intention. After five years, a plan for the economic development of the poorest parts of the country should be in full operation. After putting down the guns, you must find ways to alleviate poverty, irrigate dry land, and provide people with jobs’or else the causes of war will persist. To me, in 2002, just the thought of people pursuing that long-term goal is an immeasurable blessing. Joanna Macy, Ph.D., is an eco-philosopher grounded in Buddhism and living systems theory who works worldwide with mouvements for peace, justice and ecological sanity. Her books include Coming Back to Life (New Society, 1998); World As Lover, World As Self (Parallax Press, 1991); Rilke’s Book of Hours (Riverhead, 1996); and her memoir, Widening Circles (New Society, 2000). Où en est la pleine ordination de Bikkhuni dans la tradition Théravada ? Question aux enseignantes: suis-je censé arrêter de penser? Question aux enseignantes : Guérir ou accepter l’impermanence ?